This was an exciting year for botanical discoveries in New York state parks. Everyone heard about the federally-threatened Isotria medeoloides (small whorled pogonia) that turned up in Orange County in May. But there were eight more new state-rare plant populations documented in state parks this year. Five of these species were found on Long Island, which was a focus area for the NYNHP state parks surveyed this year. 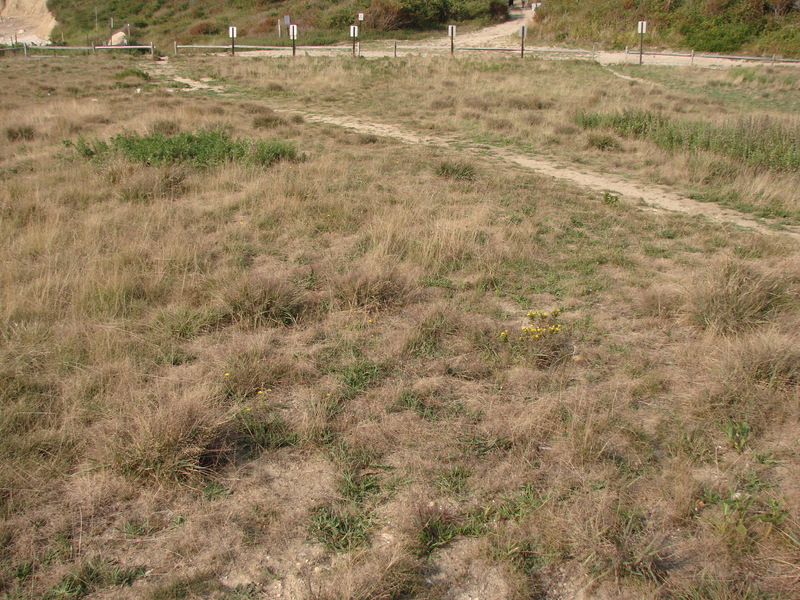 Three of the species found are listed as state-endangered; these are Juncus brachycarpus (short-fruit rush, S1) at Montauk Point State Park, Bartonia paniculata ssp. paniculata (twining screwstem, S1) at Connetquot River State Park, and Polygonum aviculare ssp. 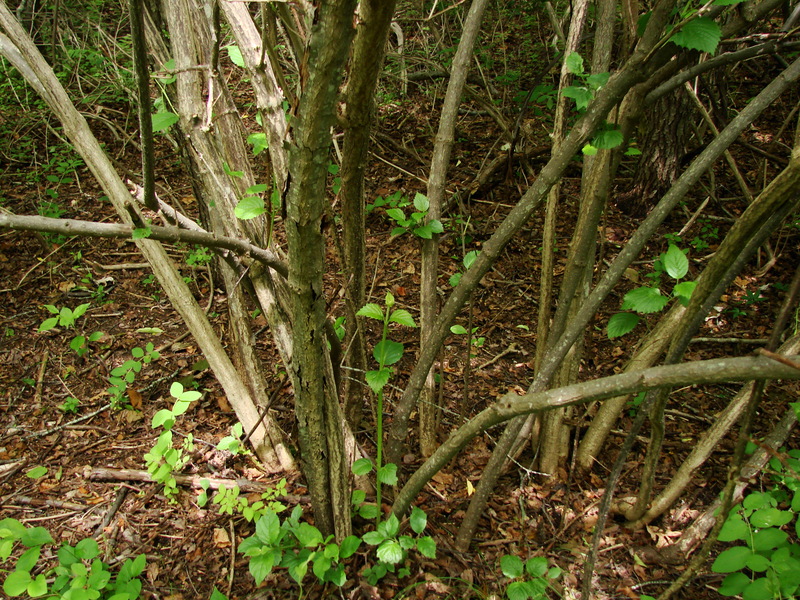 buxiforme (Small’s knotweed, S1) at Hither Hills State Park. 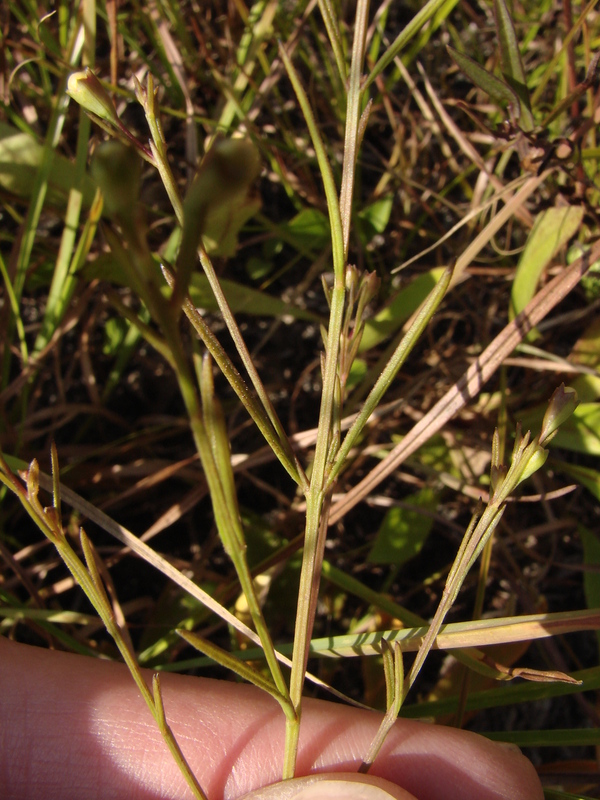 The discovery of another population of short-fruit rush is particularly exciting, as there is only one other extant population known in the state. The other two species found on Long Island are Eupatorium torreyanum (Torrey’s thoroughwort, S2) and Desmodium ciliare (hairy small-leaved tick-trefoil, S2S3), both found at Shadmoor State Park and listed as state-threatened. 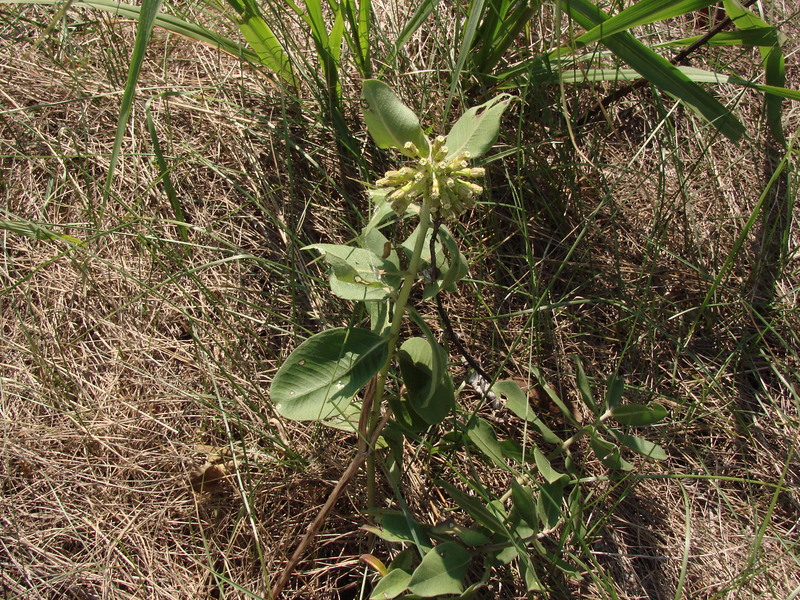 Back up north, during additional surveys for Isotria medeoloides, a new population of the state-endangered Endodeca serpentaria (Virginia snakeroot, S2) was discovered at Highland Lakes State Park. 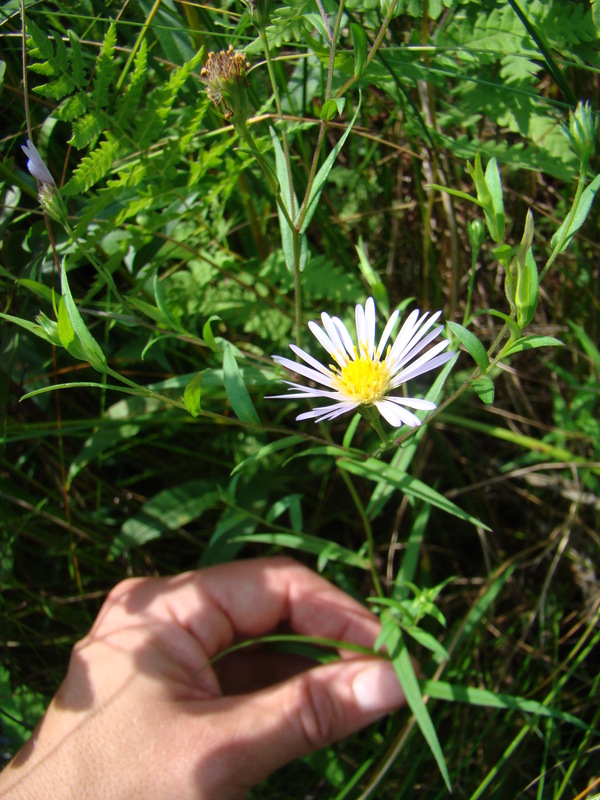 At Taconic State Park, Symphyotrichum boreale (boreal aster, S2, threatened) was discovered, and at Chenango Valley State Park, a new population of Botrychium oneidense (blunt-lobe grape-fern, S2S3, endangered) was found. All of these discoveries point to the need for continued survey efforts for rare plants throughout New York. It’s a big state and we still have a lot to learn! From Steve Young, NY Natural Heritage. 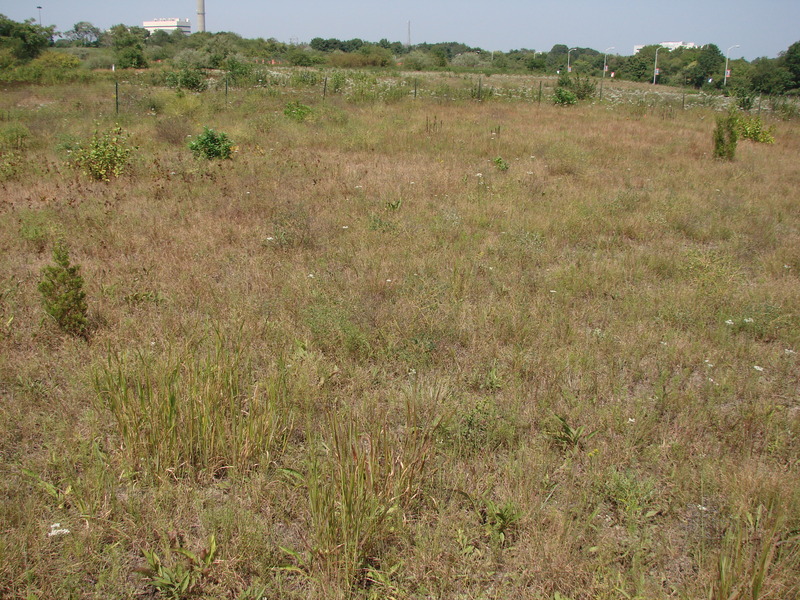 In August and early September I searched grassland habitat on Long Island for Sandplain Gerardia, Agalinis acuta. 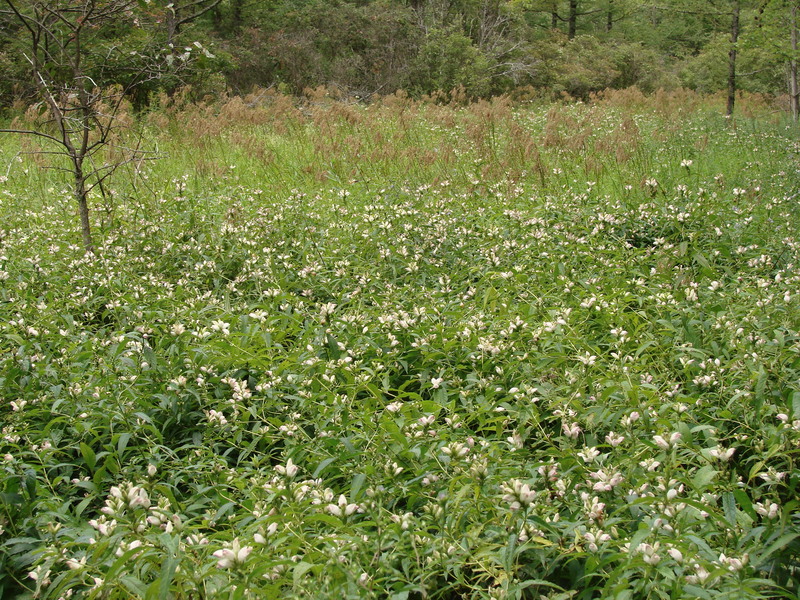 There are only a few sites left on Long Island for this federally endangered plant but some new sites have been established by planting seeds in the last decade. With the help of volunteers Rich Kelly, Mike Feder and Carole Ryder we explored known grasslands and some new sites to see if sandplain geradia has been overlooked recently. Unfortunately we did not see any new populations but saw other interesting plants during our search. 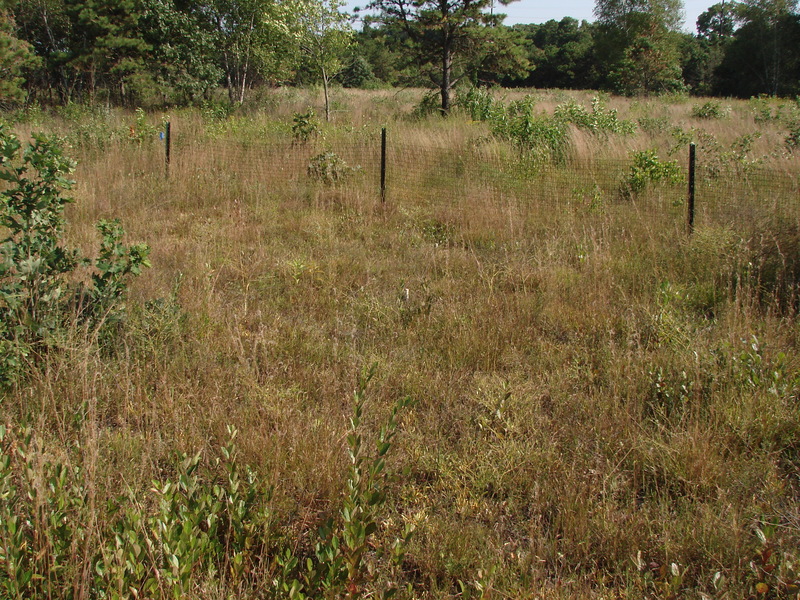 Most of the native grassland areas on Long Island are small and are now growing up to shrubland since active management has been reduced in recent years by budget cuts and other factors. Here are some of the plants and habitats we saw. Our quarry. 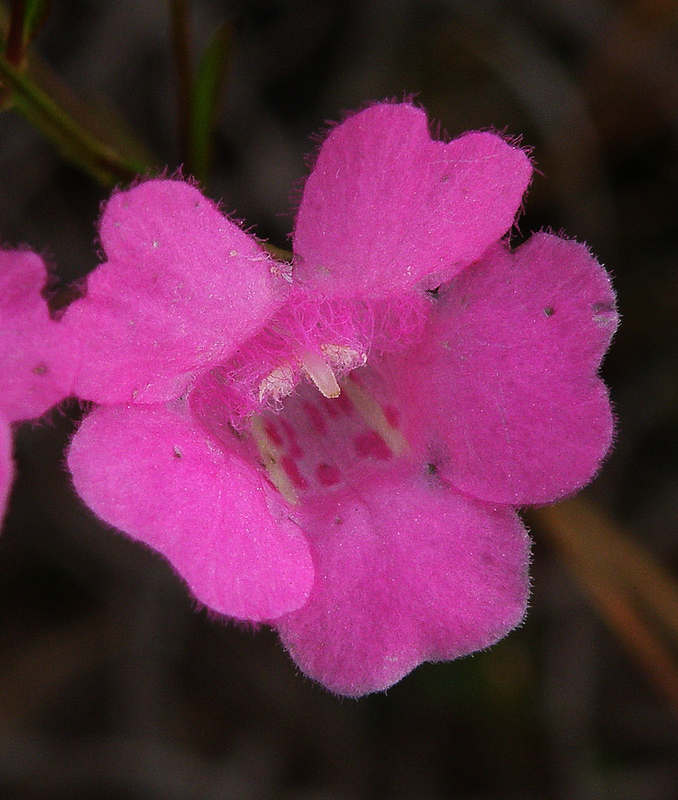 Flowers of Agalinis acuta are pink and have a notch in the upper margin. Photo Carole Ryder. The Hempstead Plains is a remnant of a much larger grassland in Nassau County that is now hemmed in by development. 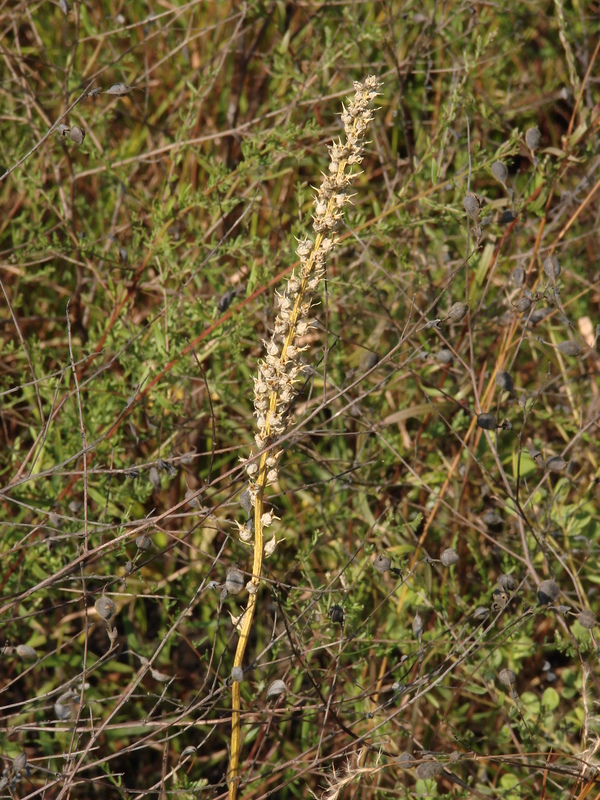 It is a managed preserve and contains Agalinis acuta. 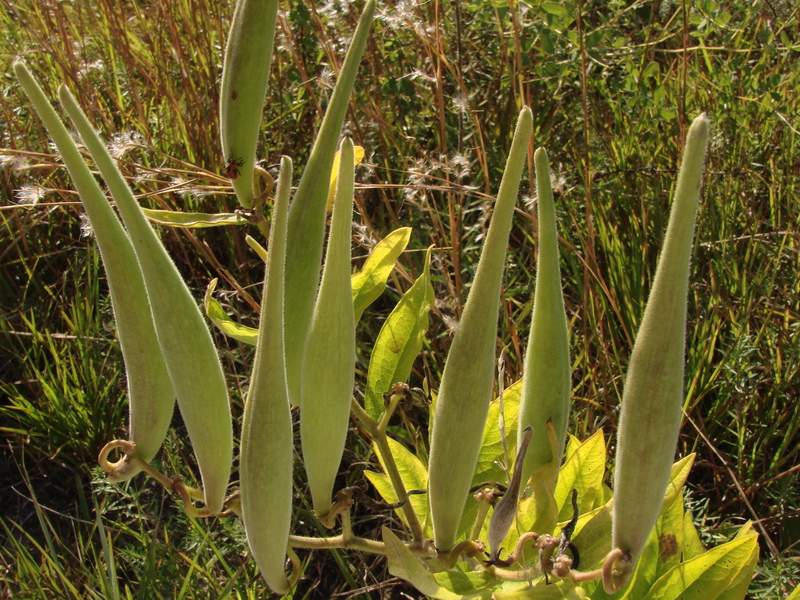 A small population of green milkweed, Asclepias viridis, still survives there despite nearby invasive species. Here is a closeup of the distinctive flowers. 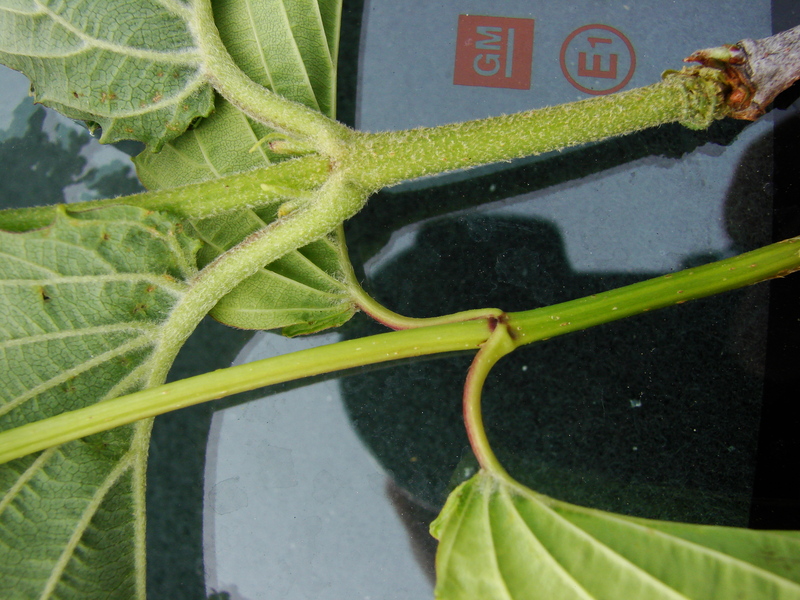 This plant of Agalinis in bud shows the narrow branches and leaves. 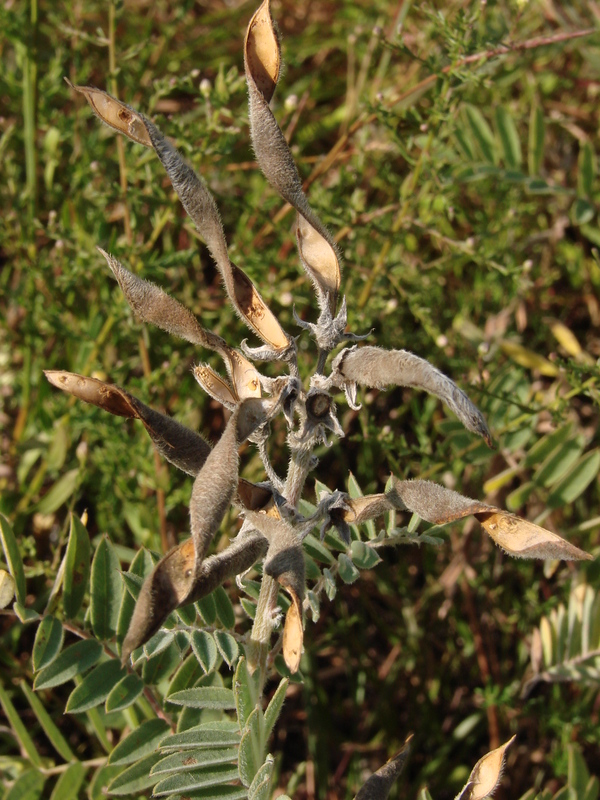 Also here are large populations of goat's-rue, Tephrosia virginiana, with its twisted pods. 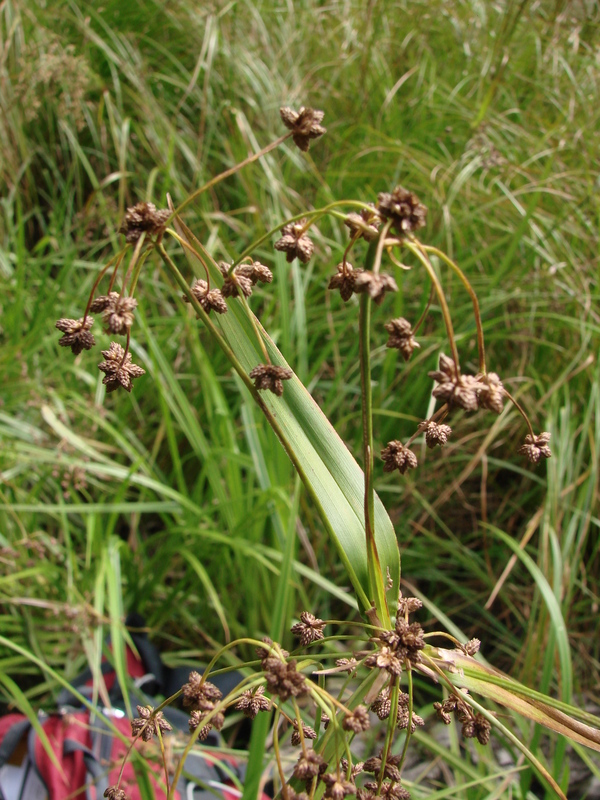 It also contains one of the largest populations of stargrass, Aletris farinosa, a state-rare plant in the Lily family. Its tall stalks of white flowers turn to tan fruit in late summer. Butterfly weed is another chacteristic plant of these grasslands. Its orange flowers and erect pods are hard to miss. The old grass airstrip and surrounding shrubland openings of Montauk airport seemed like a good place to find Agalinis. 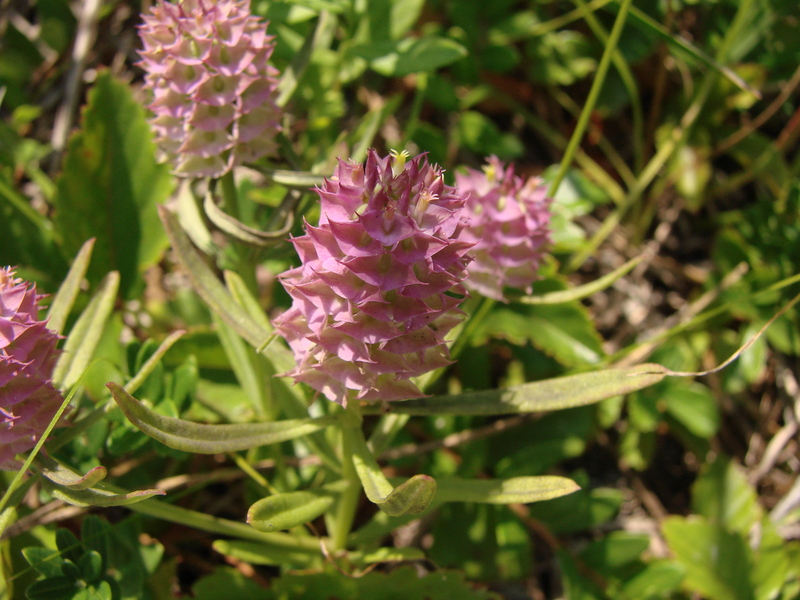 No Agalinis but there was another pink flower here, on the Natural Heritage watch list, cross-leaf milkwort. 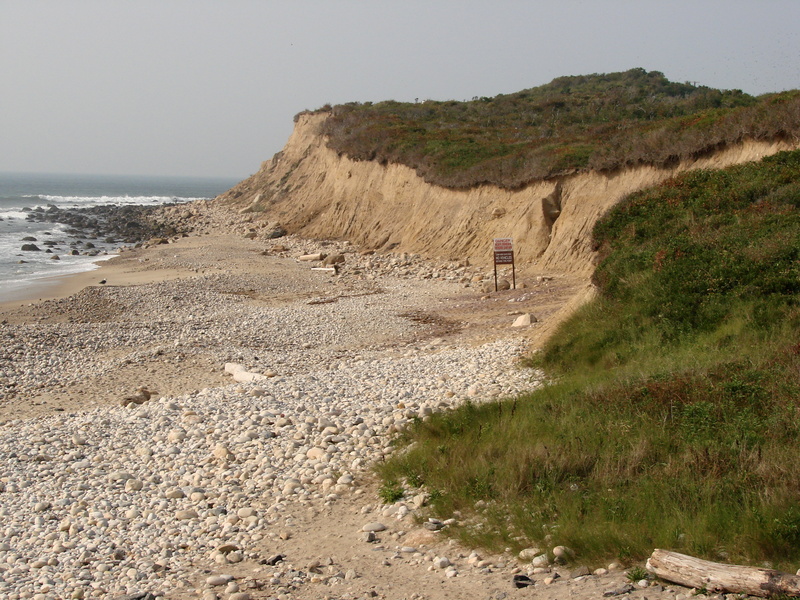 The tops of the eroded bluffs at Camp Hero at Montauk Point contain grassy openings that could harbor Agalinis (there are small populations on bluffs to the west) but they turned out to be too small or too weedy. 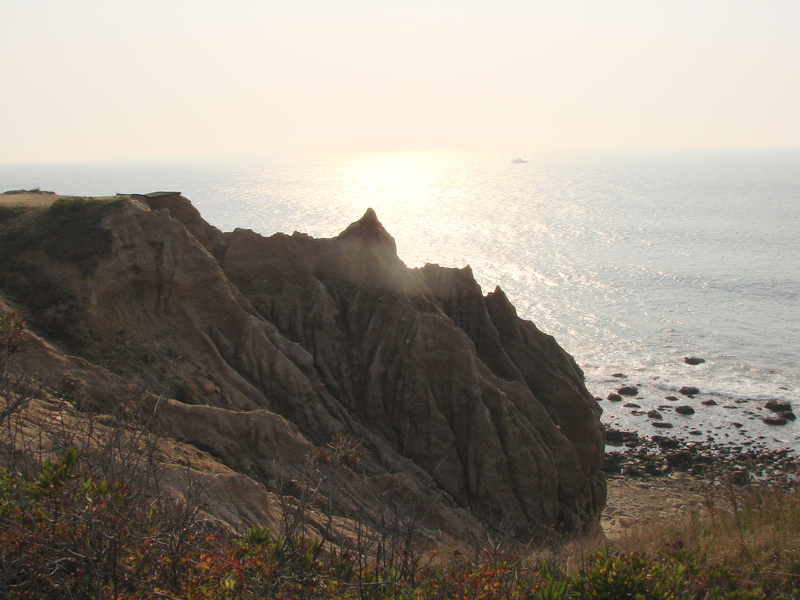 The bluffs are covered with maritime shrubland. 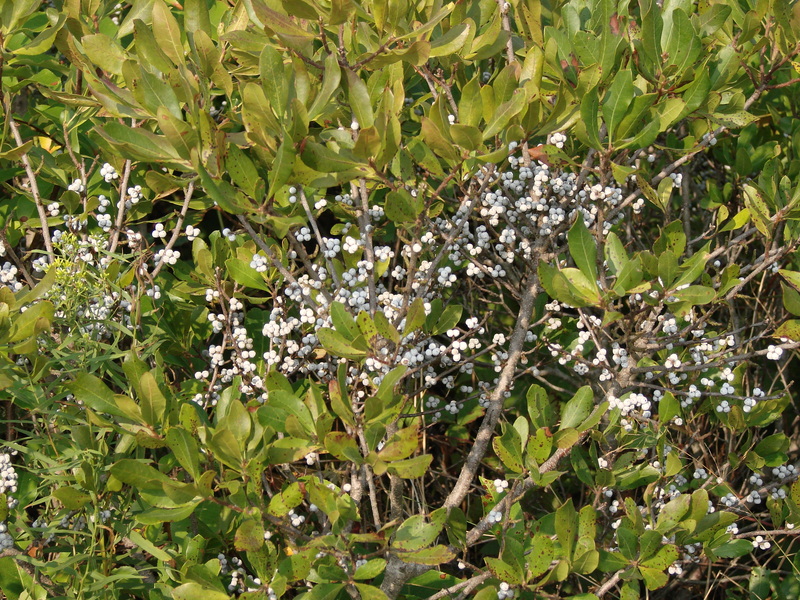 The light blue fruit of Bayberry, Myrica pensylvanica, are common here. 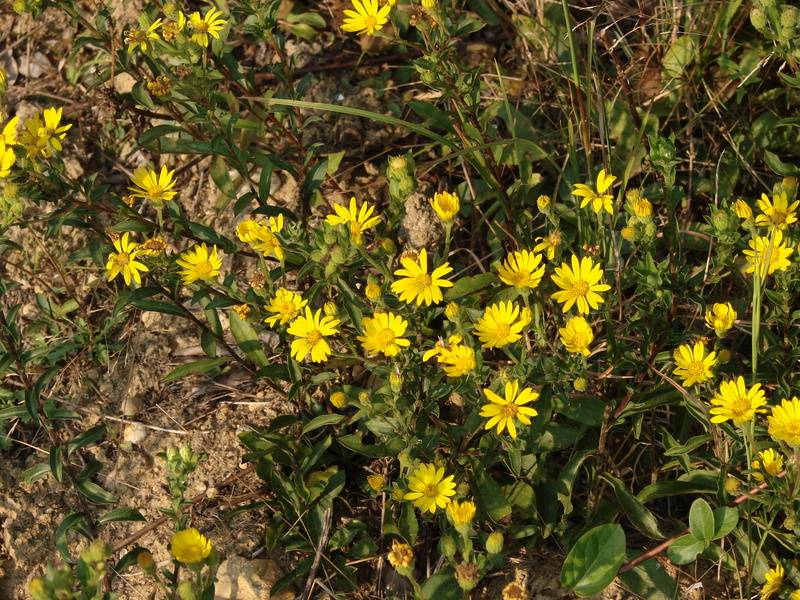 As are the bright yellow flowers of golden aster, Chrysopsis mariana. Below the lighthouse is a small grassland area but no Agalinis. Turn around and you see one of the state's most recognizable landmarks. 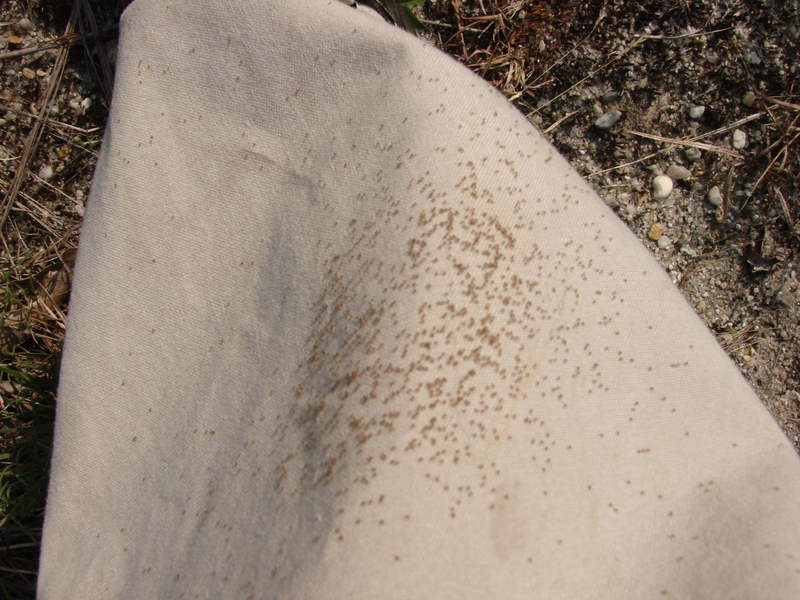 When exploring shrublands and grasslands at this time of year we had to put up with the masses of tiny red larval ticks that can end up on pant legs looking for their first blood meal. Fortunately they don't contain disease but can leave an itchy bite. They are often confused with chiggers which probably don't live in New York. On the way back to home base I stopped to check on a population of whorled-pennywort, Hydrocotyl verticillata, in Montauk. 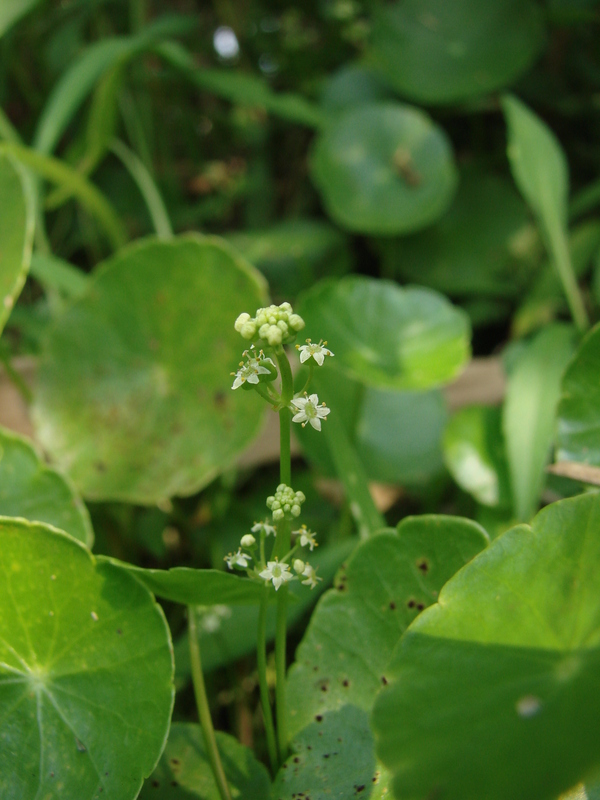 Its small white flowers are in multiple tiers above the round peltate leaves. Some years the water is so high here the plants are not visible but this year they were easily seen. Steve Young, New York Natural Heritage Program – During our last week of searching Steuben and Allegany Counties for the federally threatened Northeastern Bulrush we did not find any additional populations but we encountered good habitat dominated by other plants. 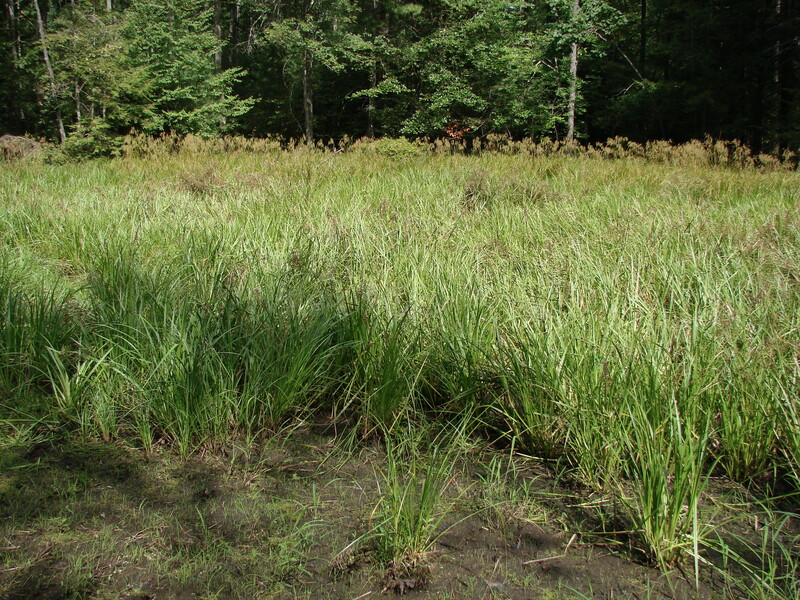 This marsh was fairly deep and dominated by Carex comosa and cattails. Downstream the marsh turned into a pond with clumps of pickerel-weed in duckweed. 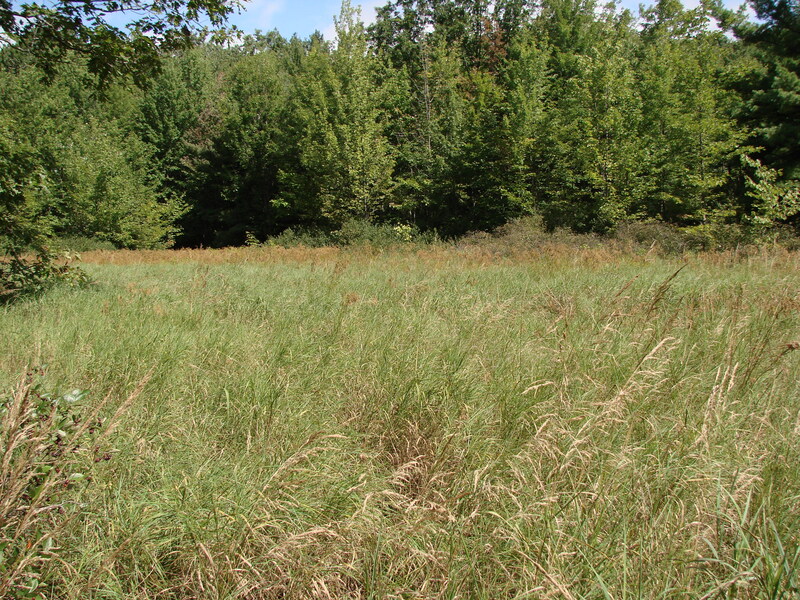 Another vernal wetland in Steuben County is dominated by grasses. Some wetlands looked good on the aerial photos but turned out to be dug ponds. David Werier looking disappointed. 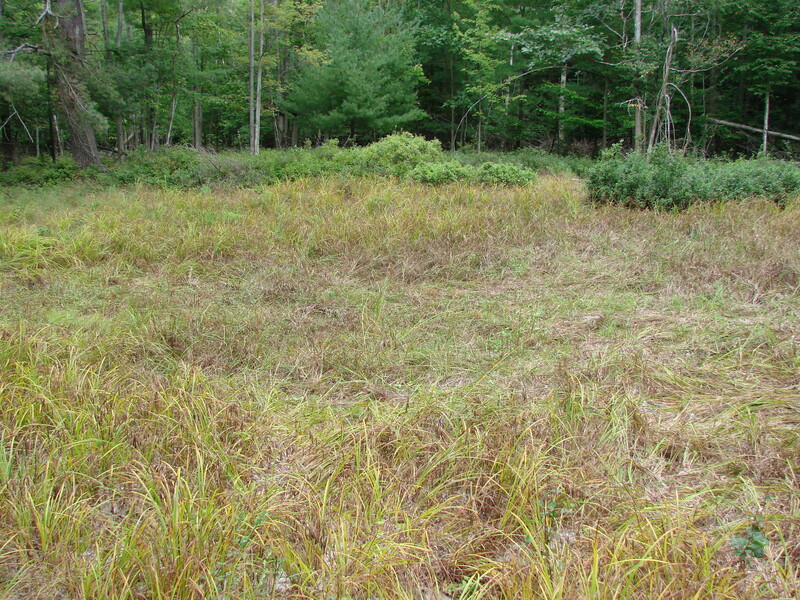 This round vernal wetland looked like it had an excellent chance of containing bulrush but was dominated by Carex gynandra. Another excellent candidate but this time it was dominated by Carex tuckermanii. It was a new species for Steve Daniel (on the right). 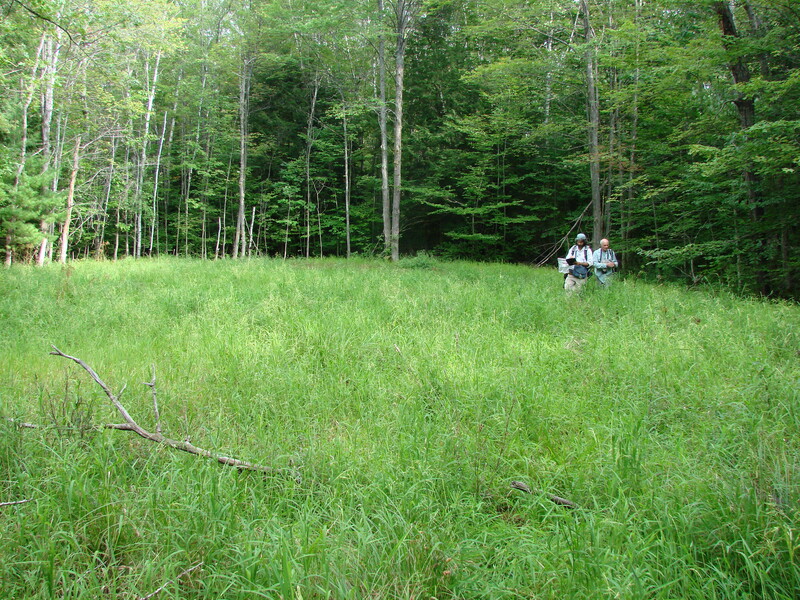 In a state forest in Allegany County the dominant plant in the small wetland was Calamagrostis canadensis. The last little wetland I searched was dominated by turtle-heads, one of the biggest populations of this plant I have seen. 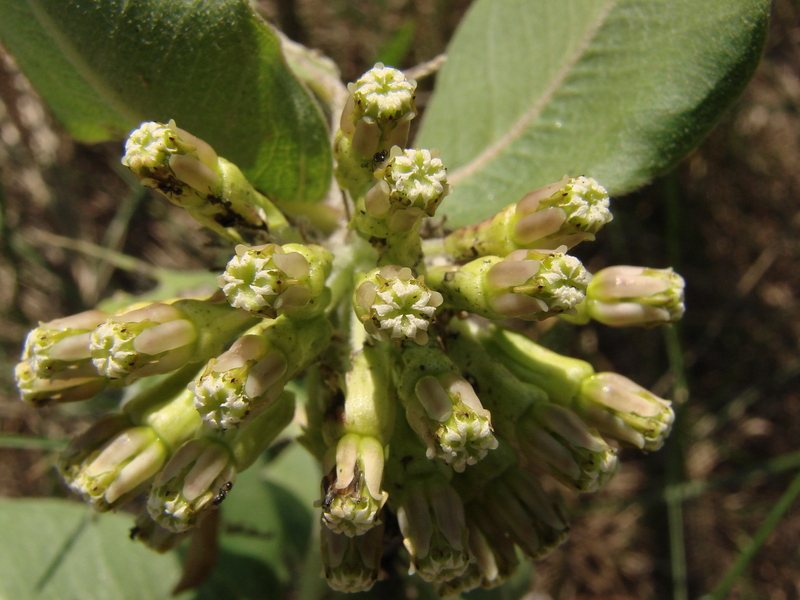 Here is a closeup of the inflorescence with flowers and buds. 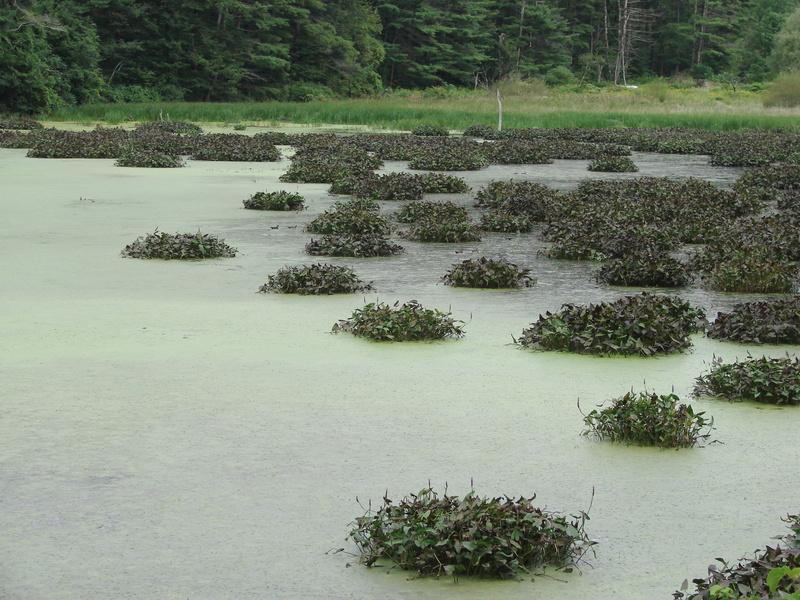 From Steve Y0ung, NY Natural Heritage Program – This federally-threatened plant is known from Virginia north to Vermont. Learn more about it at the Center for Plant Conservation website HERE. In New York, there was only one historical collection, from the Putnam Mountain area in Washington County in northeastern New York, from September 1900, and it was listed as extirpated from the state. The location for the historical record has been searched numerous times but no plants have been found again. 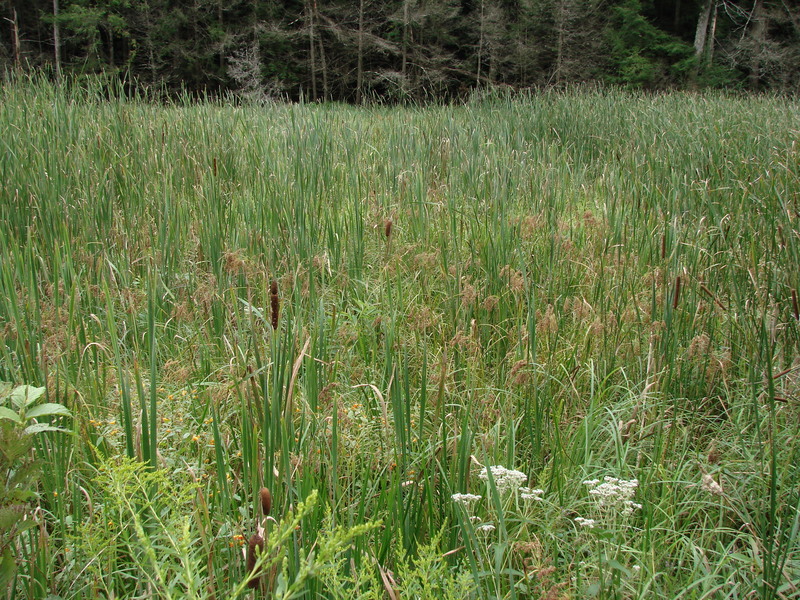 In recent years more populations of the bulrush were found in adjacent Vermont and in northern Pennsylvania in a county adjacent to New York. It was frustrating that we couldn’t find it in New York – it was so close by. This year I received funds from the US Fish and Wildlife Service to look for it again in the Southern Tier of New York to see if there were populations extending north from Pennsylvania. 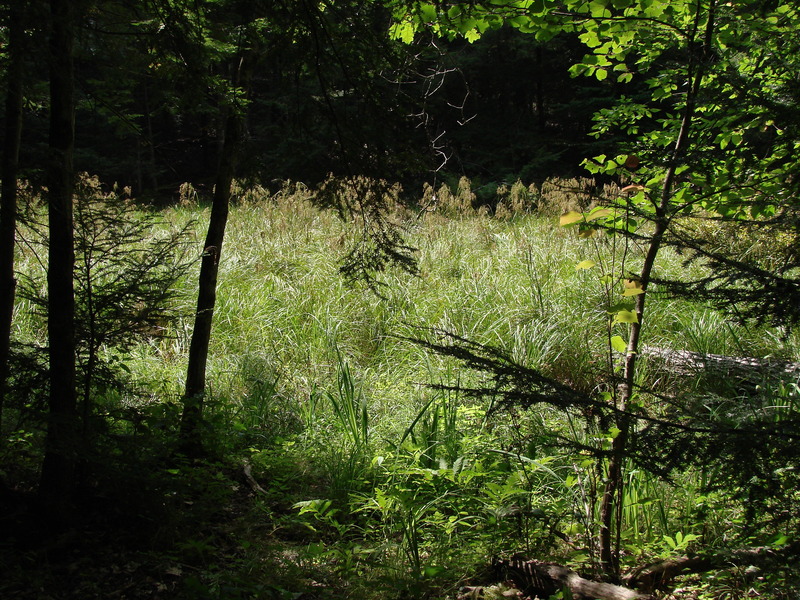 On the second day of searching small wetlands in Steuben County, south of Corning, I finally found it. It was growing in a small (40 m diameter) vernal wetland at the top of a hill that I had identified as a place to search using topographic maps and Bing birds-eye-view aerial photos on the web. One month shy of the 110th anniversary of its last collection in New York, it was back in our flora. I spent two more days searching other wetlands in the county, and I have more days to search later in the month so I hope I can discover more populations. Dr. 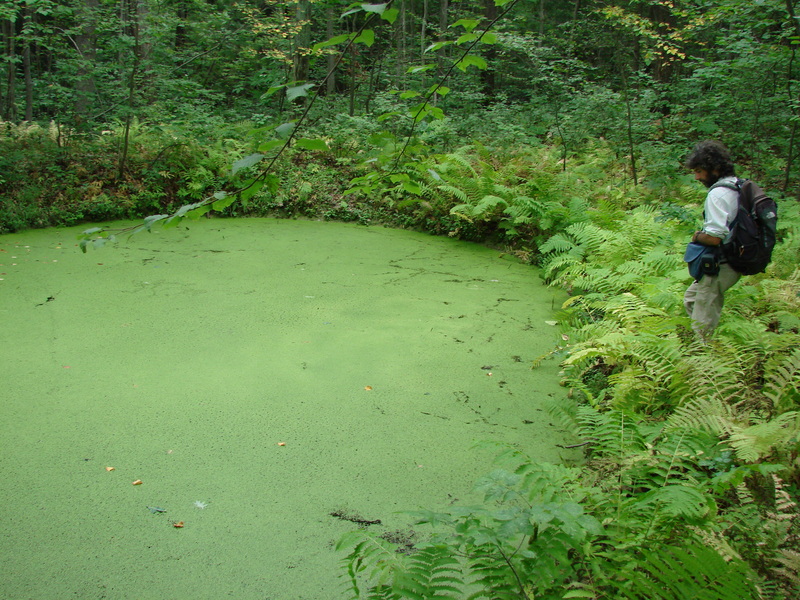 Rob Naczi from the NY Botanical Garden will also be searching areas near Vermont. Let’s hope he will find some in that area as well. Stay tuned to this blog . . .
Below are some of the photos from the population in Steuben County. 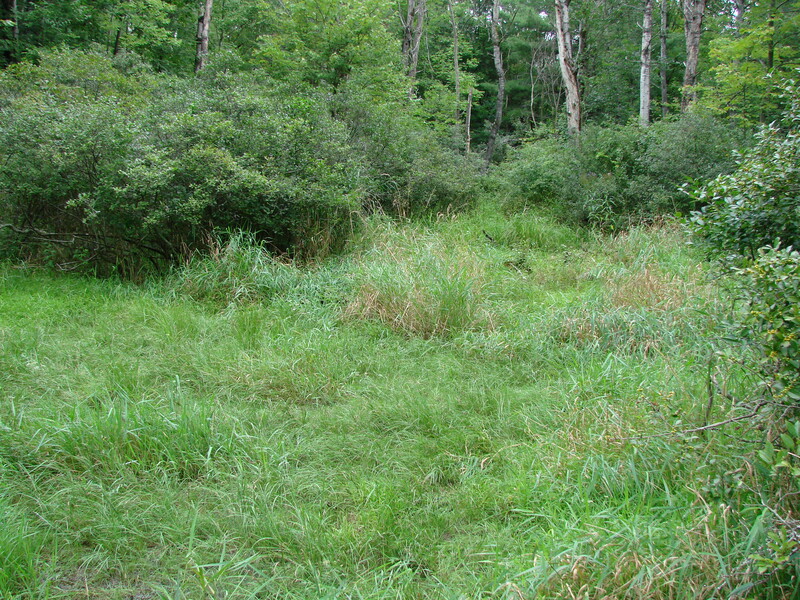 This is what the wetland looked like as I approached through the hemlock woods. In the middle was a small open muddy area surrounded by Northeastern bulrush. The species has rays that arch down from the top of the culm. 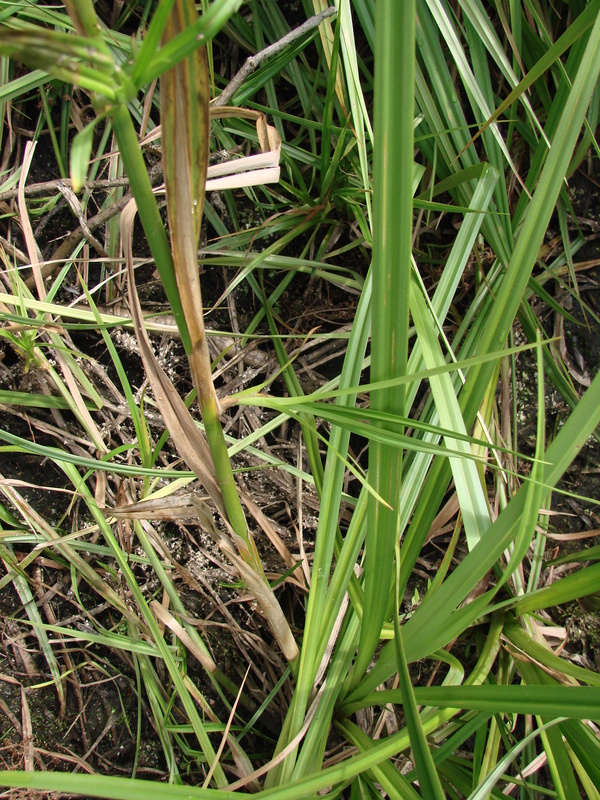 The culms usually lay down and root in the mud. 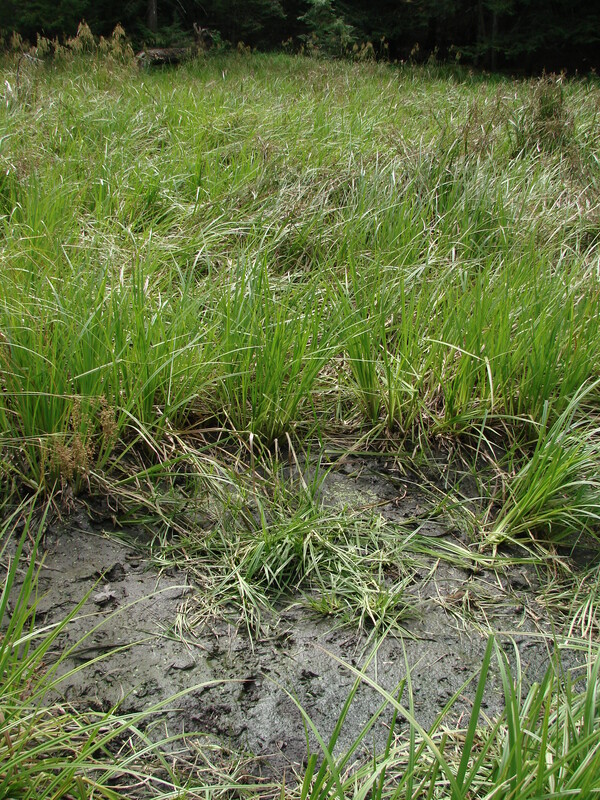 The peripheral open muddy areas had different plant species but the area covered by the bulrush was almost a monoculture. From Steve Young – NY Natural Heritage Program. 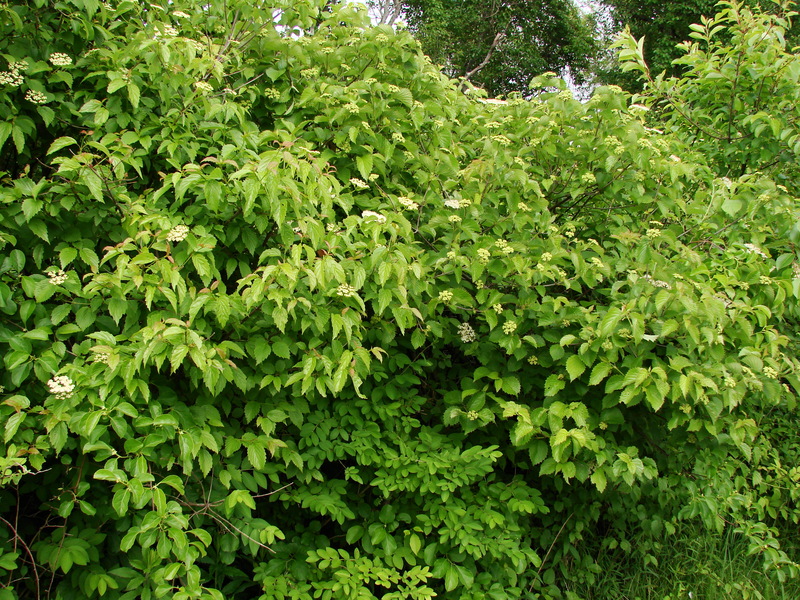 In New York two varieties of Viburnum dentatum are found, var. lucidum, northern arrowwood, also called Viburnum recognitum in some books, and var. dentatum, southern arrowwood. 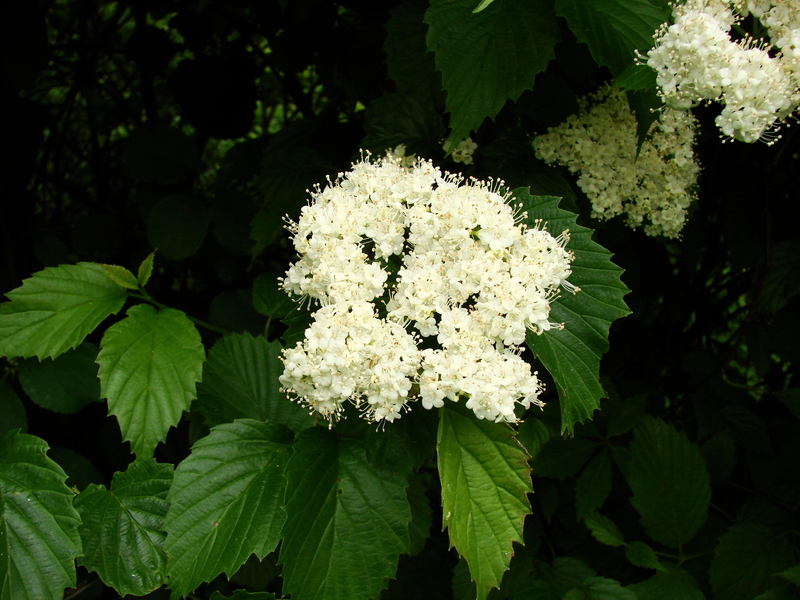 Viburnum dentatum var. dentatum is found south of New York. 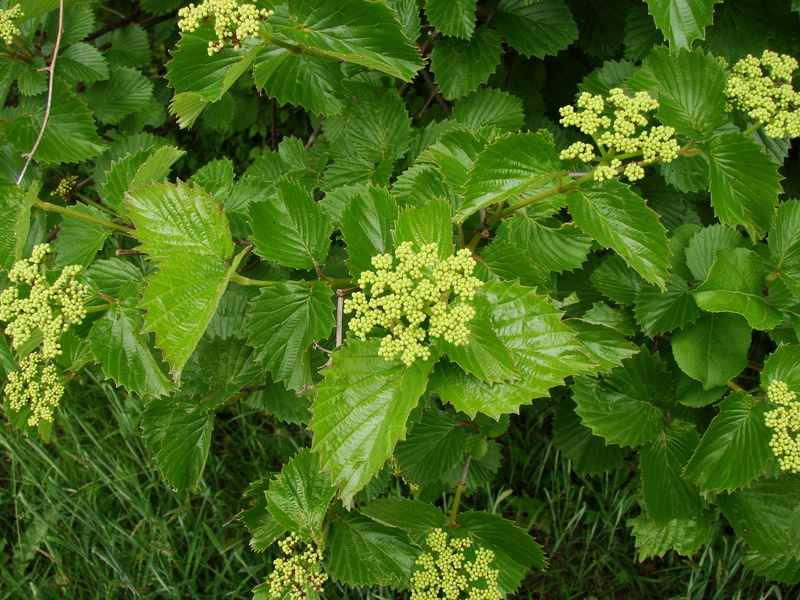 Viburnum dentatum var. lucidum is found throughout the state while Viburnum dentatum var. venosum is found only in Suffolk County in New York and mostly on the very eastern end of Long Island. 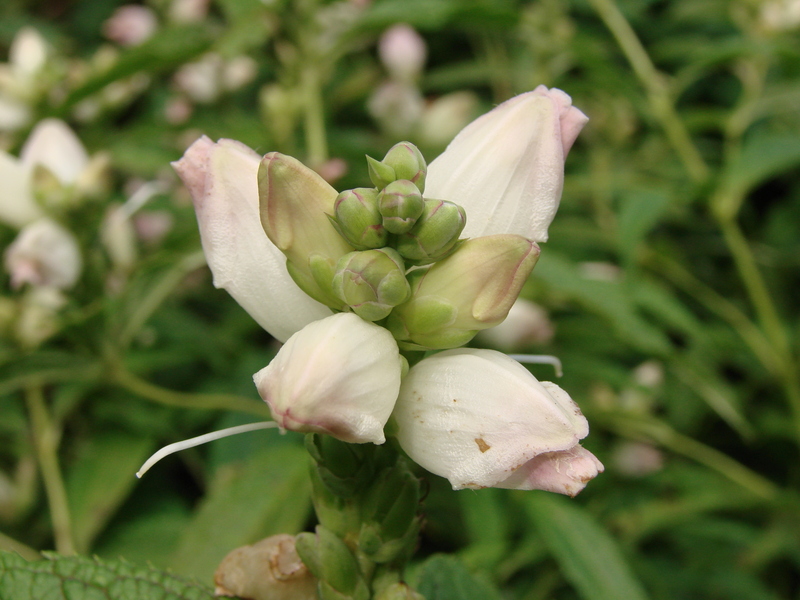 It is presently considered a rare plant by the New York Natural Heritage Program and ranked as S2 – threatened. 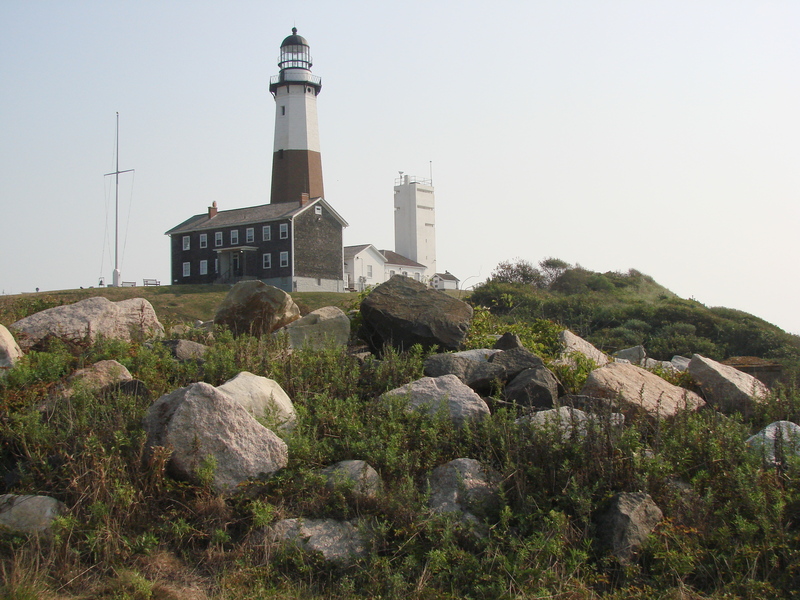 In June I surveyed the area around Montauk west to Southampton on the South Fork of Long Island to see how common this shrub really is. 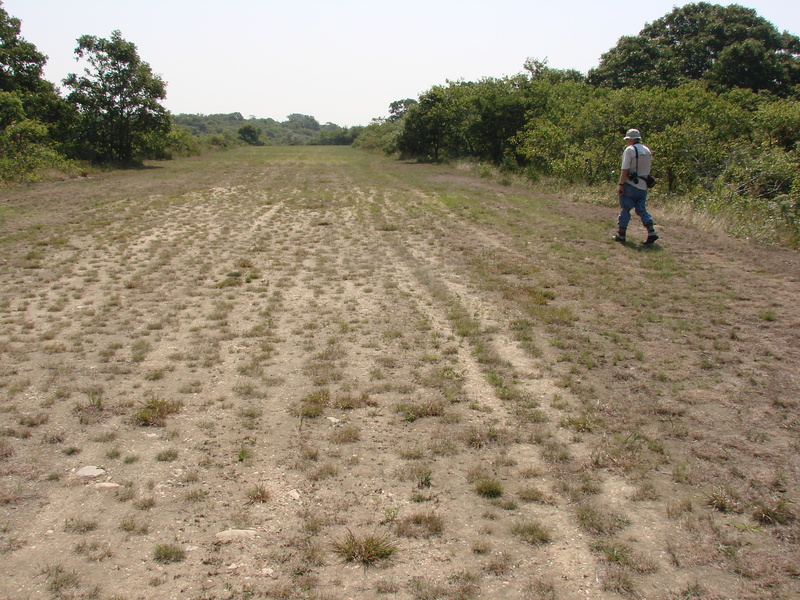 On Eastern Long Island it occurs in maritime shrubland with the more common var. lucidum but it can be distinguished fairly easily by leaf and reproductive characters. It flowers and fruits about two weeks later than var. lucidum and its leaf petioles and undersides are covered with stellate hairs that are absent on var. lucidum. The photos below show the difference. 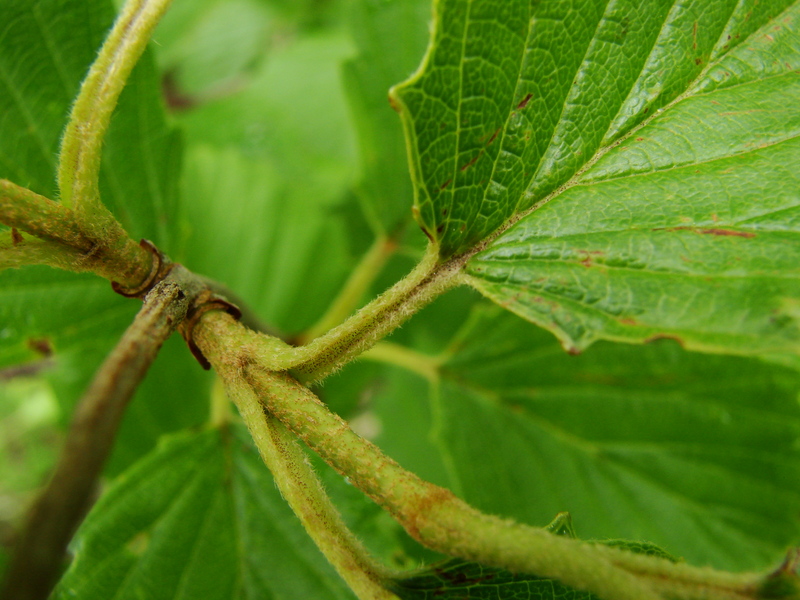 Northern and southern arrowwood beside each other. Northern on the left in bloom and southern on the right in bud in early June. When southern arrowwood is in bud. Southern arrowwood has stellate petioles and twigs. 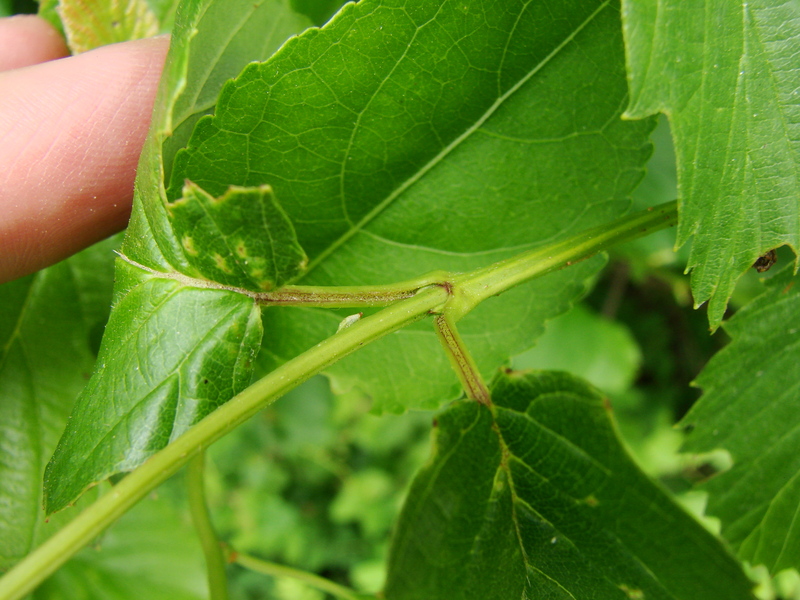 Northern arrowwood has glabrous twigs and petioles or with small straight hairs in the petiole groove. Can you tell which species is which here? Variety venosum on the top and var. lucidum on the bottom. The brown rough bark with white lenticels looks similar on both varieties. Because these plants flower at different times, their leaf characters are different, and they occur together instead of separated geographically, I would tend to call them different species rather than varieties. Variety venosum has been described as a species, Viburnum venosum, in the past and I would tend to agree with that taxonomy from what I have seen on Long Island. 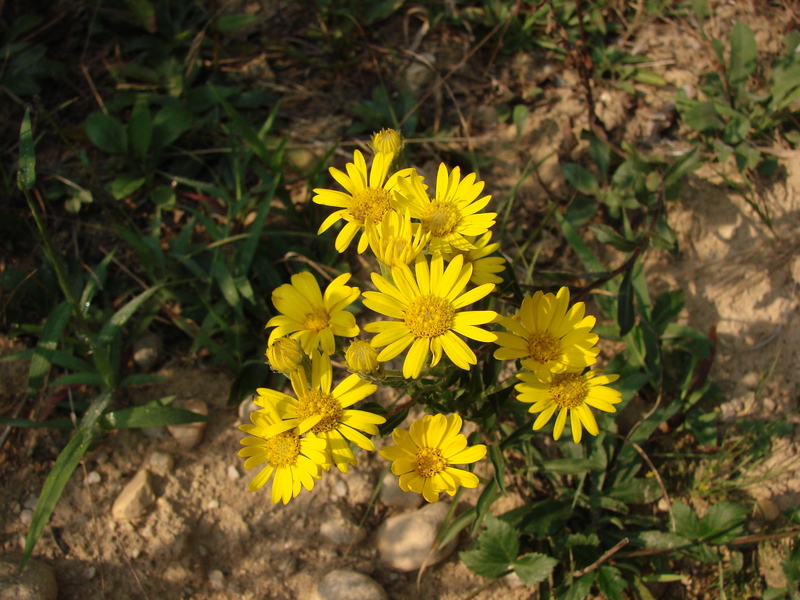 I surveyed many roadsides and shrublands on the South Fork in June and southern arrowwood was present in good numbers in most of them. I am now recommending that its rank be lowered from threatened to rare and it put on the Heritage Watch List. 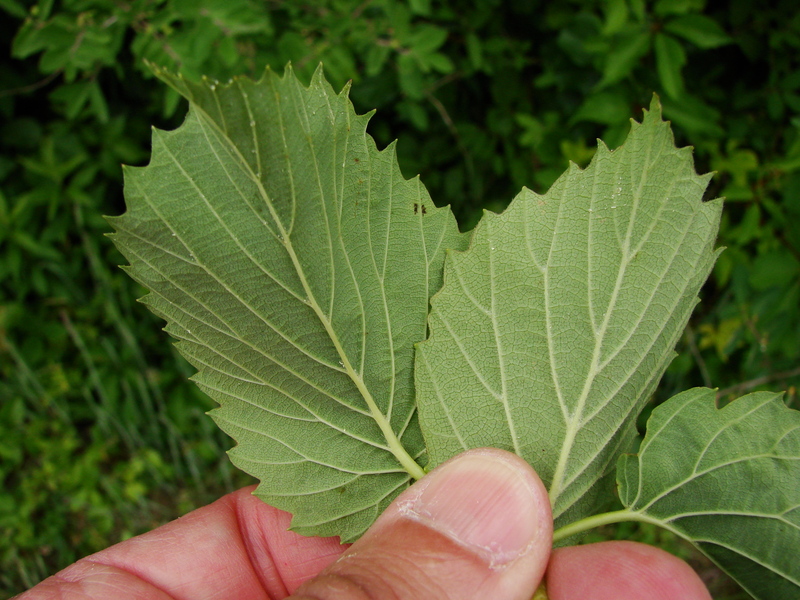 Even though it is more common than we thought it should still be monitored because the non-native viburnum leaf beetle (Pyrrhalta viburni) has been completely defoliating this and a few other viburnum species in parts of New York. After the initial discovery this summer of Isotria medeoloides in Orange County, a follow-up survey was done this week and almost 100 more plants were counted. That is an encouraging sign that the plant is doing well and may be in other areas. The New York Natural Heritage Program is planning to evaluate and search additional habitat in Orange County to see if the orchid occurs anywhere else nearby.